With the new flexmls system we are able to pull data much sooner. 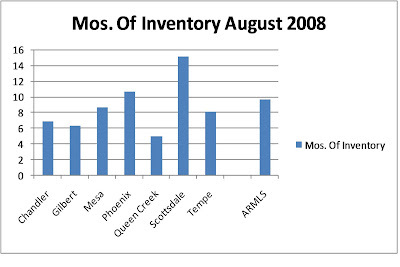 Above is a graph which compares the number of months of inventory for the East Valley cities, Phoenix, and Scottsdale with the full MLS for the area. Below is a slide show of graphs for each city showing the number of active listings, the number of new listings, and the number of solds by month for the last 24 months. It is encouraging to see that in a number of cities the number of active listings has decreased in the past few months. This data is supplied by the Arizona Regional Multiple Listing Service. ARMLS, West USA, and Pat & Amy Monahan do not guarantee the accuracy of the data.